There is so much to explore in the Great Smoky Mountains National Park besides hiking. These are the best things to see and do if you want to make the most of your time in the Smokies. One of the ways to enjoy the natural beauty of the Great Smoky Mountains is by cooling off next to one of its many waterfalls. There are several to marvel at, and visitors can easily reach them via hiking trails within the Great Smoky Mountains National Park. Laurel Falls is an 80-foot (24-meter) waterfall that sprays mist overhead and plunges into a narrow gorge at the bottom. Abrams Falls is a 20-foot (six-meter) waterfall with a 100-foot (30-meter) wide natural swimming pool that visitors often use to cool off during the hot Tennessee summers. Grotto Falls is a 25-foot (7.6-meter) waterfall that people can actually walk behind, and Ramsey Cascades, the tallest waterfall in the park, drops 100 feet (30.4 meters) over rocks and collects in a small pool often full of salamanders. There’s an area of the Great Smoky Mountains National Park known as “moonshiners’ paradise” where the Sugarlands Distilling Company sits. The locally owned distillery, which opened in 2014, offers free daily tours, distilling workshops, and tastings of various award-winning spirits. For those who want a more personal experience, there are premium tour options, which offer behind-the-scenes experiences where people can enjoy the distillery’s signature Sugarlands Shine in a private setting. Sugarlands Shine is available in a variety of flavors, and visitors can sample it at the Sippin’ Posts around the distillery. 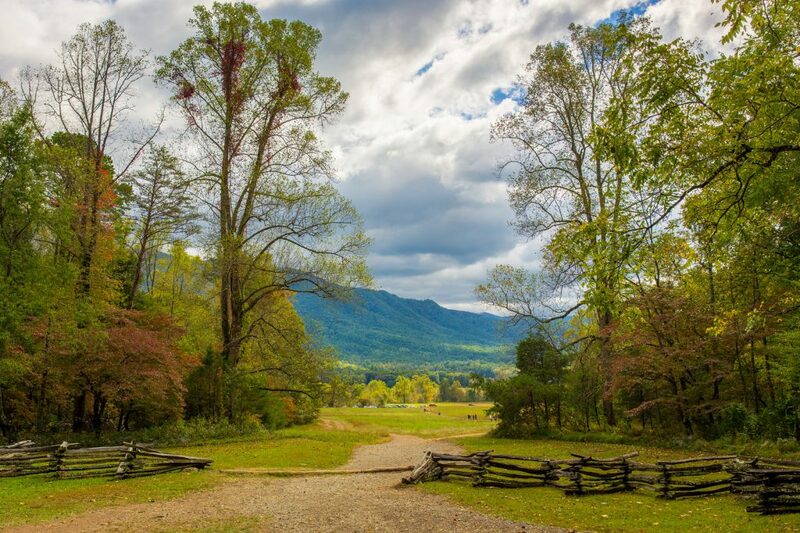 Cades Cove is a gorgeous, verdant valley surrounded by mountains that motorists can circle to watch for wildlife and enjoy the breathtaking views of the Smokies. The one-way loop is 11 miles (18 kilometers) long and can take two to four hours to complete. Along the way, there are places to stop and hiking trails, as well as several buildings to explore that are representative of pioneer life in 19th-century Appalachia. These structures include The John Oliver Cabin, The Primitive Baptist Church, The Myers Barn, and The Carter Shields Cabin. The busiest times of year for Cades Cove are summer and fall, and weekends throughout the year. There are several horseback riding stables in the park that are available from mid-March through late November. Guided rides are done at a walking pace along scenic park trails and last from 45 minutes to several hours. About 550 miles (885 kilometers) of the park’s hiking trails are specifically designated for horse use. There are also five drive-in horse camps that provide access to backcountry horse trails. Guests will find the camps, which are open from April through October, at Cades Cove, Big Creek, Cataloochee, Round Bottom, and Towstring. At an elevation of 6,643 feet (2,025 meters), Clingmans Dome is the highest mountain in the Smokies and the highest point in Tennessee. It sits at the top of the Great Smoky Mountains National Park, accessed via Newfound Gap. After taking the access road, there is a half-mile walk to the summit. At the top of the dome is the 45-foot (14-meter) concrete Clingmans Dome Observation Tower, built in 1959, that offers panoramic views up to 100 miles (161 kilometers) away. The observation tower is open year-round; however, the access road leading to it is closed from December 1st through March 31st. If you’d like to see wildlife in the Great Smoky Mountains National Park, your best bet is to go in the winter when the animals are more visible. Since a dense forest covers the land, the wildlife often hides behind tree branches, which lose their leaves during the winter. The six-mile (9.6-kilometer) Roaring Fork Motor Nature Trail is a winding road that motorists can take and an area where wildlife sometimes roams. White-tailed deer, black bears, elk, and raccoons are some of the common animals found in the park. Since animals are most active at night, it’s a good idea to carry binoculars and look for them in the evening. Cataloochee Valley was one of the largest and most prosperous settlements in the 1900s. Some 1,200 people lived in the valley, and most made their living by farming. Today, there are many preserved historic buildings, including two churches, a school, and several homes. You can tour these structures using a self-guiding auto tour booklet, and there is more to explore by walking a couple of miles to the 5.2-mile (8.4-kilometer) Little Cataloochee Trail. Visitors can find historical information and exhibits at the Palmer House.